Showing 9 articles from April 20, 2013. Raymond’s O.R. Nevitt Memorial Swimming Pool will be starting its seasonal aquatic’s programs soon. As a fundraiser, P.O.O.L is selling community spirit beach towels. Seven Willapa Valley students attended the WA-FCCLA state leadership meeting April 10-12 in Wenatchee. We’ve started a brief discussion about Alzheimer’s, and generally the information is less than exciting, due to its incurable and terminal status. There is a tendency, however, to become so immersed in this topic that it seems that it’s an inevitable outcome of aging. Spring and summertime are when honeybees swarm – usually because their hive has become overcrowded and they are looking for a new home with more space. Willapa Valley defeated Three Rivers Christian by six strokes in high school golf at Three Rivers Christian April 11. The Willapa Harbor girls team finished third and the Raymond boys were fourth. Logan Woods of the host team was the medallist with a nice round of 38. Valley’s Spencer Schwiesow was second with a 42. Emma Lorton was medalist for the girls with a round of 48. U.S. Senator Maria Cantwell (D-WA) expressed her condolences to the victims of last week’s bombing in Boston, during her opening statement at an aviation safety hearing in the U.S. Senate Committee on Commerce, Science and Transportation. Cantwell also praised Federal Aviation Administration (FAA) Administrator Michael Huerta for acting quickly to protect the skies over Boston, following the attack. 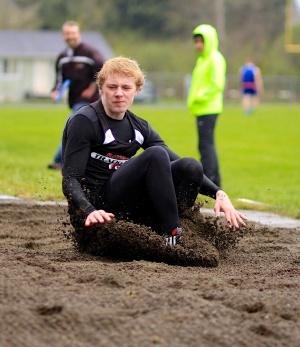 Photo by Paulene Maneman Raymond’s Rayce Newman placed fourth in the long jump at Raymond’s home meet April 11.